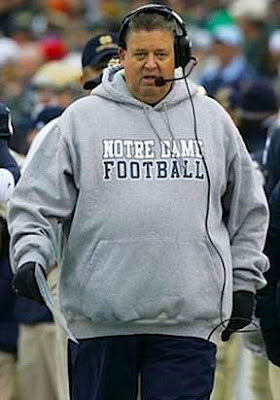 If Crewcut Charlie Weis wasn't under pressure in 2007, he certainly will be in 2008. A stumbling and bumbling 3-9 season had a huge impact on NBC's ratings of Notre Dame telecasts. All told, numbers were off 40% from last year and are now half of their 2005 levels. In fact, ratings for NBC's telecasts were half those of ABC's college football games. The network pays $9 million a year to broadcast this nonsense and, according to Business Week, the downturn could affect the Fighting Irish's next TV deal. The current agreement ends in 2010. In other words, Weis needs to start winning and winning fast. As Notre Dame losses piled up this fall, the network had to adjust its advertising pricing strategy, giving loads of free ads (known as make-goods) to companies like Allstate and Procter & Gamble to justify the $55,000-to-$80,000 rates for a 30-second ad it negotiated before the season started. Thanks to Kevin of We Are Penn State. 3-9 AVOID THE RUSH, TRANSFER EARLY! Recruits are bailing....... ND football is a has been program by every measure. AVOID THE RUSH, TRANSFER EARLY! Why did Prince wait so long to transfer....he should have listened!!!!! Now if Clausen was smart he'd go too.